So instead of boring you with a couple of paragraphs on the importance of mobile user experience for customers, let me show you some stats that will help you to understand the need of a mobile app for businesses. So, now we know the businesses should have a mobile app or website for their customers. Keeping this fact in mind, the following is a case study for developers on how to propose a mobile app to their companies or even clients. Following is a proposal exercise for a hypothetical mobile app. Anyone who’s a regular traveler on the ferries operated by the Bridgeport & Port Jefferson Steamboat Company is familiar with the website used to place trip reservations, www.88844ferry.com. Based on messages that greet callers to their phone-based reservation system, it’s clearly the medium that the company prefers that their customers use. Despite this—and frustratingly for customers—the company has largely failed to invest in their website. For many years the website, which functions well enough when viewed on a desktop computer, has delivered a broken experience on tablet and smartphone platforms, preventing successful reservation transactions. An online system that’s relied upon as the primary method for generating customers should meet modern customer expectations for online convenience. As stated by Internet economist Mary Meeker, “many mobile-enabled urban millennials believe that they should get what they want (products/services/work) when they want it.” While the online convenience expectation for millennials is high, it’s not a stretch to assume that slightly older suburban customers would like the same. Though travel and transportation apps are rated as accounting for less than 6% of all app downloads, the Pew Research Center reports that 46% of cell phone users in the U.S. use their phones to access public transportation information. We’re not looking to vastly expand the company’s income with this proposed app, but rather to improve customer satisfaction with the reservation and schedule system offered by the ferry company. If the app is successful, it’s possible that it may translate into some additional revenue due to increased bookings, but that would largely be a positive side effect, not the main driver for the effort. According to mobile product strategy consultant Rahul Varshneya, there are four essential elements that successful mobile apps share: they solve a problem, they’re intuitive, they receive advance marketing, and they are strategically distributed. In the case of our app, we’ll clearly be solving a problem for ferry customers by making it easy to make a reservation from their smartphone. We’ll design our app to be as simple as possible to use. Our goal will be to design an app whose use is so obvious that even first-time users will be successful in completing their task. Advertising for the app will be placed on the ferries in prominent locations well in advance of the app’s availability. This will build advance buzz, customer awareness, and anticipation by ferry regulars. Lastly, we’ll be strategic about our distribution by focusing on our narrow customer base and avoiding attempts to gain wide (and largely useless) notoriety in the cluttered catalogue of the Apple and Android app stores. Customers who will benefit from our app will come to know about it through advertisements on the reservation website as well posters placed on the ferries themselves. Improving the seamlessness of the reservation process is our primary goal. To support this, we’ll give the user the option to be “remembered” by the app so that they never have to login again, reducing the number of login credentials that they have to remember as well as the number of finger taps needed to place a reservation. We’ll make a small screen-friendly ferry schedule available. This schedule will mimic the native calendar app of Apple’s iOS devices in which time periods for review can be selected: by the day, the week, or the month. Once a time period is selected, the user will be presented with a scrolling interface in which they can quickly scan through ferry schedules with the swipe of a thumb. Likewise, booking a reservation will be a key function of our app. Once a desired ferry and time is selected, the user will be presented with an input screen for credit card information. The app will automatically detect the type of card being used based on the format of the card number, again reducing the amount of effort required of the user. The app will verify that the card is valid. Two elements that make an app valuable to users are messaging and notifications. Both of these elements are a natural fit with our ferry application: is the ferry running late? Are there disruptions to normal service? If users choose to accept push notifications from the app, they’ll receive notifications on their mobile device when there’s a service disruption for a ferry on which they’ve reserved a trip. We may also consider sending a push notification in the case of bad weather. Some passengers who are prone to seasickness like to know what to expect. It may affect their decision to stay in their vehicle or walk to the passenger deck. They might even shift the reservation if their schedule permits. Generally, there are eight useful metrics for measuring the success of an app: number of users, session length, session interval, time spent using the app in a 24-hour period, the number of users who download the app from a specific venue, screen flow, user retention, and “lifetime value.” Of those metrics, there are four that are most applicable to the type of app that we’ll be creating. Number of times the app was downloaded. If we observe very few downloads compared to our known customer base, we’ll know that either our marketing and awareness campaign has failed or that customers are uninterested in the product. Retention. This is the number of users who returned to the app following first use. If we see that users use the app once and never use it again, we could conclude that it’s too difficult to use or that it has no perceived value to the customer. Session length. This is how long each use of the app lasts. 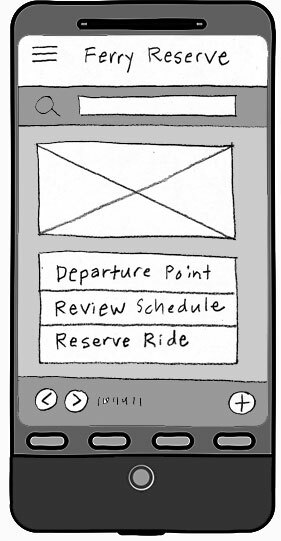 The goal of some app designs is to keep the user engaged with it for as long as possible. In the case of our ferry app, we’d like to see session lengths that are as short as possible, The less time that it takes a customer to satisfy the goals of reviewing the schedule and booking a reservation the better. Lifetime value. This is a measure of how much money the app has generated. We’ll be able to record how much revenue was generated through mobile reservation bookings on a customer-by-customer basis, giving us a measure of the app’s value to the company.